I’m also in the Steochalong 5 this year and it’s been a total blast! If you love cross stitch and snark and just plain weirdness these are your peeps. They are definitely my peeps! The group is 1000+ strong this year! What a ride. It’s hard to describe, so here’s their website. I decided to buckle down and work on Snooze to see if I can finish it before Thanksgiving. My brother and his wife are coming to visit for thanksgivingchristmas and it would be cool to (finally) give it to them! I bought this years ago after searching for it in every craft store for more years. Yes, I am aware of the internet and it’s shopping capabilities, but the search was part of the fun for that kit! 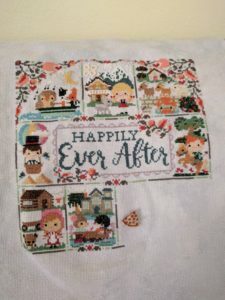 I haven’t done stamped cross stitch before and kind of made a mess of it when I started it but I picked it up earlier this year and got the hang of it. The right hoop totally helps! Well worth it. 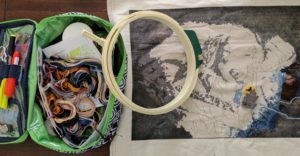 I bought the Clover 7″ Turnable Hoop last month and it’s fantastic, especially for linen/linen like fabrics. I love the size too, it’s easy to hold. Stamped cross stich definitely takes some getting used to after 20+ years of counted cross stitch, lol. 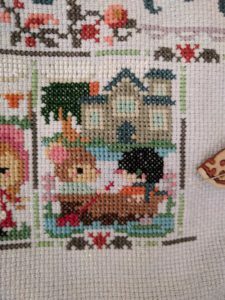 I love looking at cross stitch pics online and my mind wanders everywhere wanting to work on this WIP or that, so I like deciding on one to finish, with one or two smaller projects in between. I get a lot more done that way. I’m doing the same with yarn too! I’m 60% done with a very cool crochet shawl and I picked up an old WIP to finish. More on those later.